BROTHER SL-1110 Single Needle Lockstitch Replacement Parts One of the new generation of Industrial Sewing Machines from BROTHER. High Quality Machines demand High Quality Replacement Part. Never Compromise - CALL US. 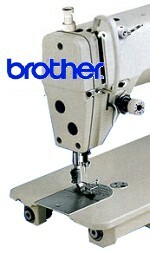 Need A Part For Your Brother SL-1110 ? We hold large stocks of Industrial Sewing Machine Spare Parts and Needles for Industrial Sewing Machines. Please call, we are sure we will be able to help you.